Batoff Mountain, in northern Raleigh County, rises to 2,594 feet above sea level along the valley of the New River northeast of Beckley, West Virginia. The community of Piney View, West Virginia, is located on a bench along the east summit of the mountain above Piney Creek. “Batoff” may be a corruption of the French word “batteaux,” a flat-bottomed boat of a kind that were floated down the river from Hinton, West Virginia, in the late 1800s. Such craft were unreliable on the rough New River, and at least one wrecked near the foot of the mountain, according to historical accounts. 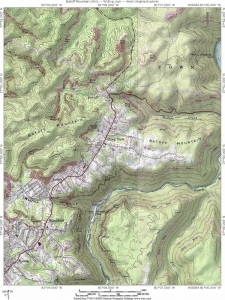 The winding and sometimes worrisome descent of highway 41 from the Batoff upland to the New River earned the area the grim title of “bad off,” and the name is occasionally misspelled “Badoff Mountain.” The “bad off” nomenclature may predate the modern highway: the wagon road that descended the route was subject to rockfalls and mudslides.